In the world of modern PC graphics hardware, all the buzz right now is about a rendering technique call ray tracing. This is mainly due to the release of Nvidia’s RTX development platform and Microsoft announcing its compatible DirectX Raytracing (DXR) API for DirectX 12 for Windows, both having taken place earlier this year. DXR allows Windows developers to utilize modern GPUs to accelerate the process of ray tracing a 3D environment in real time. This is big news for gamers because ray tracing allows for a much more realistic rendering of light and it’s real-world behavior within a 3D scene. Or…it will be as, presently, only a few games have been updated to utilize the rendering features that DXR brings to the table. And there aren’t a lot of GPUs out there yet with hardware designed with DXR in mind, directly targeting the acceleration of ray tracing calculations. Even still, it seems that ray tracing has become the new hotness and it’s even driven some observers fairly well out of their mind. It’s what’s new in tech. Nvidia on Monday announced its next-generation graphics architecture called Turing, named after the early-20th century computer scientist credited as the father of artificial intelligence. The new graphics processing unit (GPU) does more than traditional graphics workloads, embedding accelerators for both artificial-intelligence (AI) tasks and a new graphics rendering technique called ray tracing. But ray tracing is not a new technique. In fact, it’s almost as old as the earliest of 3D computer graphics techniques. In computer graphics, if we have a three dimensional scene we typically want to know how our scene looks trough a virtual camera. The method for computing the image that such a virtual camera produces is called the rendering method. The current standard rendering method, know as rasterization, is a local illumination rendering method. This means that only the light that comes directly from a light source is taken into account. Light that does not come directly from a light source, such as light reflected by a mirror, does not contribute to the image. In contrast ray tracing is a global illumination rendering method. This means that light that is reflected from other surfaces, for example a mirror, is also taken into account. This is essential for advanced effects such as reflection and shadows. For example if we want to model a water surface reflecting the scene correctly we need a global illumination rendering method. With a local illumination rendering method the light from the water surface can only be determined by the light directly on it, not the light from the rest of the scene and thus we will see no reflections. Ray tracing works by following the path of light. We follow the path of rays of light, i.e. lines of light. For an example of such a path consider a ray of light from your bathroom light­bulb. This particular ray of light hits your chin, some of it is absorbed, and the rest of the light is reflected in the colour of your skin. The reflected ray is then reflected again by the mirror in your bathroom. This ray then hits your retina, which is useful otherwise you would not see your self shaving. In exactly this way a ray of light in the virtual camera gives the colour of one pixel. The first time the technique known as ray tracing was used to render a scene seems to have taken place around 1972. The Mathematical Applications Group, Inc. (MAGI) was formed in 1966 in order to evaluate exposure to nuclear radiation and did so using software they developed, called SynthaVision, that involved the concept of ray casting, allowing radiation to be traced from a source to its surroundings. By tracing light instead of radiation, SynthaVision was then adapted for use in Computer-generated Imagery or CGI and became what was likely the first ray tracing system ever developed. In 1972 MAGI/SynthaVision was formed by Robert Goldstein, Bo Ghering, and Lerry Elin to drive SynthaVision‘s use in film and television. The first CGI advertisement video, which was for IBM, was done by MAGI in the 1970s as well as the majority of the CGI work in the 1982 Disney film Tron. In 1985 Commodore released the 7.14MHz, 16-bit Amiga computer with its groundbreaking video graphics capabilities. One of the early demos created for the Amiga that really caught people’s attention was the The Juggler demo. It was a looping, 24-frame animation of a ray traced juggling figure displayed in the Amiga’s unique HAM mode which allowed its entire palette of 4096 colors on screen at once. I remember marveling over the Juggler on my Amiga back in early 1986. The Juggler was rendered frame-by-frame using an experimental ray tracing program called ssg, written by the animation’s creator, Eric Graham. It made such an impact that Graham expanded the program into Sculpt 3D which he brought to market. Sculpt/Animate 4D followed and it inspired a flurry of Amiga-based ray tracers from many different developers. 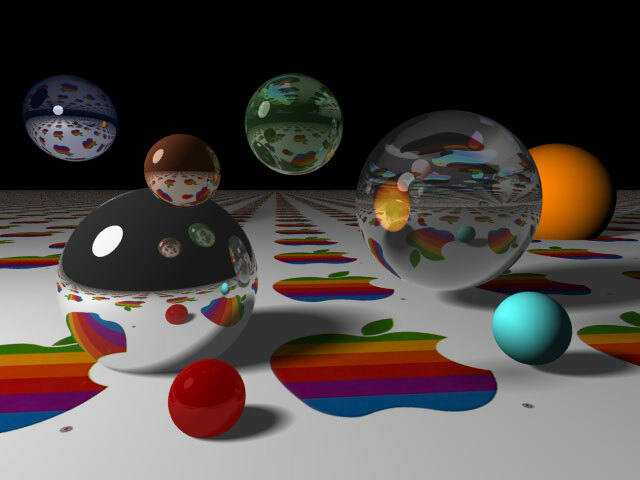 Hundreds of other ray traced animations soon appeared online on the local dial-up Bulletin Board Systems, rendered on the Amiga as well as many of the other platforms of the day. And, from Tron right up to today, ray tracing is a big part of the creation of basically all CGI films, such as the entire catalogs of Pixar, DreamWorks Animations, and many others. Something to be aware of here is that all of the animations and films I’ve spoken of are rendered frame-by-frame in a very lengthy process, often involving large arrays of very powerful computers, or render farms. Tron‘s imagery was rendered to film line-by-line, so meager were the computing resources — though mainframes they were — of the time. It took Pixar’s render farm an average of four hours to render a single frame of their early film, Toy Story. That render time has remained fairly consistent at Pixar over the years; as their computing resources have grown, they have increased the render complexity of each frame in each successive production. What today’s buzz is all about is real time ray tracing. That’s what DirectX Raytracing is concerned with. It utilizes CPU and GPU power to perform certain ray tracing functions, but also supports compute hardware designed specifically to perform ray tracing calculations, such as the Turing microarchitecture GPU at the heart of the Nvidia GeForce 20 series graphics cards. The “RT” cores in a Turing GPU are said to perform ray tracing calculations eight times faster than the GeForce 10 series’ GPUs based on the Pascal microarchitecture. Of course, software (read: games) must support ray tracing, through DXR or another means, in order to deliver these next-level visuals to our retinas. For a look at some such visuals, see DigitalFoundry’s look (video) at a ray tracing-enabled build of Battlefield 5 at this year’s Gamescom. So, ray tracing. It’s a rendering technique that has been around for over 45 years. It’s nothing new. Finally seeing the benefits of this technology enhance the environments in our games and VR worlds — in real time — thanks to new APIs and dedicated consumer hardware, that’s the New Thing. This entry was posted in Just Rambling and tagged 3d, BBS, compute, GPU, graphics, rendering, RTX, SGI. Bookmark the permalink. You got vitriol for that post? Wow, I guess there are some out there that have nothing better to do than be jerks. One of my friends did some stunning pictures using POV-Ray (http://www.povray.org/) back in the mid-1990s, but they did take a long time to render on the equipment that we had at the time. I think he was able to use the ComSci department’s Sequent Symmetry (I think it had like forty-eight 80386 CPUs) to cut down the render times. Real-time ray tracing could be amazing. I’ll have to ask my friend if he ever thinks about breaking out POV-Ray on new equipment. Sadly, yes. The problem seems to be that people read the title and the first sentence or two and almost never got through the whole post and went in perturbed. I should point out that we were students when the Sequent was first installed, but Rob went on to be the department sysadmin. He was there until after the decommission of the system and its replacement by a Sun server (which took up probably 1/6 to 1/8 of the floor space in the machine room. What a great bit of history and experience there! I remember the Weitek math co-processors, very interesting that they were present here alongside the ‘387 and could be selected in compiling. Thanks for adding this. I had ported POV-ray around ’90-92 on a 386 with SCO Unix. I would leave it running over the weekend to render a few frames in a sequence of clouds blowing by in a blue sky reflected by a chrome ball a checked plane. This impressed my coworkers but really those we’re all canned elements I put in a simple scene description file. I believe you mean 32-bit.